We are pleased to announce and introduce these new great Products and Product Lines! Contact any of our sales representatives for more details and information! CANADIAN MADE - Heating and Cooling products. Both Oshawa and Belleville locations have sheet metal fabricating shops. 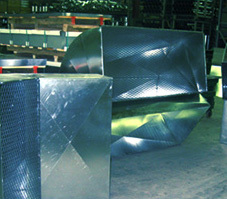 Our sheet metal mechanics have over 30 years of fabrication experience. Aside from common and standard HVACR duct fittings, with their experience they can produce almost any custom sheet metal design you require. We’ve made Chinchilla trays, maple syrup pans, snowmobile trailer covers, storage boxes, even a Tin Man Suit! Custom ductwork design for residential or commercial applications, you can be assured your fittings will match your specifications saving you time without on the job modifications. Three years ago we installed a Plasma cutting machine in the Oshawa shop. With computerised CAD design software, we can make your fittings in minimal time. We produce metal fittings made of Galvanized, Stainless Steel, Copper, Satin Coat, Cold Rolled, Aluminum and Expanded metal. Copyright 2013 Southern Supplies Ltd.